Here at TimeformUS, we do our best to make it easier to understand a race…and understand how to make the best possible Mint Julep on Kentucky Derby Day. This recipe has been honed by our team after years of experimenting. Sure, some of it is based on algorithms that anyone could figure out, but this is ultimately a hand-crafted recipe designed by self-described experts. One of the few good things about not attending the Derby is how much better a homemade Julep can be than the one they serve at Churchill Downs (the other really good thing is no painful flight home on Sunday). OK, first tip: if you don’t have one, go buy one of these (any brand will do). It’s incredibly rare that we use ice crushers, but the thing about Juleps is you want a mild snow cone effect, to mellow the flavor a bit. 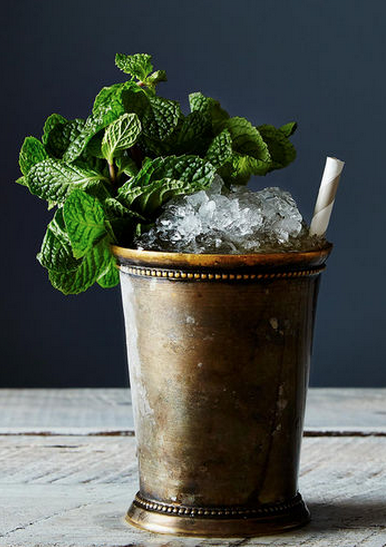 Second tip: Don’t make Mint Juleps with bourbon. Make them with rye whiskey. Look, there are historians who claim the original Juleps were made with rye, and there’s plenty of amazing rye from Kentucky, such as Sazerac. Why rye? It’s drier than bourbon. The rest of the recipe is intensely sweet, and it really benefits from the dryness of rye, vs the sweetness of most bourbon. Tip 2A: The Derby comes only once a year. If you want the sort of Mint Julep that will make you contemplate all that is right with the world, spend some extra bucks and seek out a bottle of Thomas Handy Rye. Or Willett Family Estate Single Barrel Rye. These ryes can be in the $40-$80 range, and, well, it will taste as if it’s worth it (editor’s note: Thomas Handy now goes for upwards of $300 a bottle). Third Tip: Make really strong mint syrup. The more fresh spearmint (NOT peppermint), the better. You can make it the night before you use it, and, while it’s good for a few weeks, it loses some potency after the first day or two. Fourth Tip: Buy straws to serve the Juleps with, and cut off the tip of the straws so they are roughly the height of the Julep glass. This forces the Julep drinker’s nose close to the drink and the mint garnish, and solidly enhances the Julep-drinking experience. To be clear, we didn’t make this up. It’s a bartender’s trick, and a good one. Fifth Tip: If you’re serving these Juleps for a crowd, be ready with pre-made pitchers of the recipe and then just keep cranking the ice. People love well-made Mint Juleps, and they WILL come back for seconds. They’re as addictive as the best potato chips. So have enough rye and mint syrup and extra mint (for garnish) on hand and you should be able to keep up with demand. 1) The day before serving the Juleps, put a cup of water and a cup of sugar on the stove on high together for ten minutes, no stirring needed, and you’ve got simple syrup. Let it cool for a 1/2 hr. 2) While the simple syrup is cooling, take about 4 bunches of mint, rinse them well, and squeeze them into a pitcher or narrow jar or something like that. There is some benefit to picking the mint leaves off the stems, as they will more easily steep and leave a less “grassy” flavor in the syrup, we believe. 3) Then dump the simple syrup over the mint. Take a big spoon and gently press the mint so that it steeps in the syrup. Refrigerate, covered, overnight. The next morning, strain the mint and gently squeeze it over the strainer, getting a few extra drops of good minty flavor out before discarding the leaves. Squeezing gently with your hands is good here–it’s sticky but a good way to get the last few good drops. Squeezing too hard will impart a vegetal note that is best to avoid. Having accomplished Step One, you should have essential, bright green, fragrant mint syrup. 3 ounces rye or bourbon. Stir vigorously, then stick in a couple of sprigs of mint and the shortened straw. If drinking in warm weather, it’s good to serve with some napkins or something to act as a buffer between a warm hand and the melting ice inside the glass. This entry was posted in Data Studies, Welcome to TimeformUS and tagged Julep, kentucky derby, Mint Julep, Mint Juleps. Bookmark the permalink. Perhaps the best post on this blog so far!